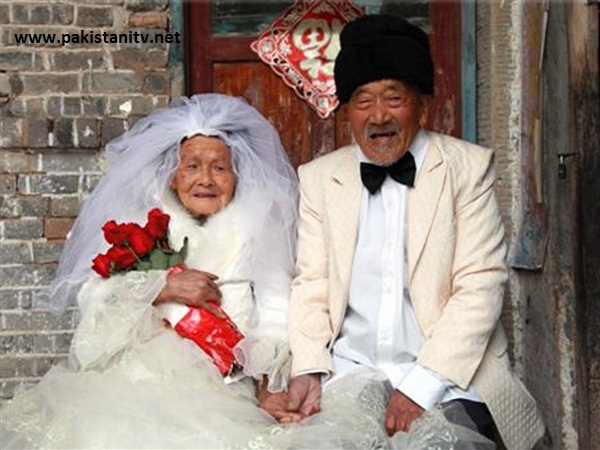 Eighty-eight years after getting married, a Chinese couple have finally gotten their wedding photos taken -- and they're still smiling. Cameras were scarce in China in 1924, when Wu Conghan, 101, and wife Wu Sognshi, 103, tied the knot, so they have no photos from their big day. But nearly nine decades later, they re-created the happiness of the event. In the long overdue pics, Sognshi wears a full wedding gown and veil and holds a bouquet of roses, while Conghan sports a jacket, white shirt and bow tie. Leaning on their canes for support in one photo and sitting down in others, the couple are all smiles. A local photographer snapped the keepsake shots as part of an initiative started by a collective of photographers in the couple’s hometown of Nanchong, in Sichuan province. As part of the program, local photographers have volunteered to take pictures of elderly couples who were not able to have pictures taken at their weddings.